But today I had to make cookies to bring to a friends tonight. And while cookies are not a drink, and these cookies don’t even have alcohol in them, they are loosely related to drinking. In that Michael went on a drinking old fashioned’s kick a while ago, and we ended up with two jars of maraschino cherries. Combine that with this recipe I have had pinned for forever, and F’n Friday it is! 1. Man passes a joint to a cop while illegally parked in a handicap spot with a gun in the car. 2. St Petersburg woman charged with throwing a bloody tampon at a cop during domestic dispute. 4. Florida man disfigured in a fight over Minute Maid punch. 5. It wasn’t the pot that got them busted. It was the 114 crabs and reptiles in their van. 6. Group of drunk fraternity brothers wore mermaid tails at beach, insisted they were mermaids. 7. Officer dresses as the Grinch and gives motorists choice of ticket or onion for holidays. 8. Man kills stepson over a chili dog. So as previously asked, how much faith do you have in humanity? Which ones are real Florida stories, and which ones are Fiction? Ponder while I eat one of these delicious cookies. 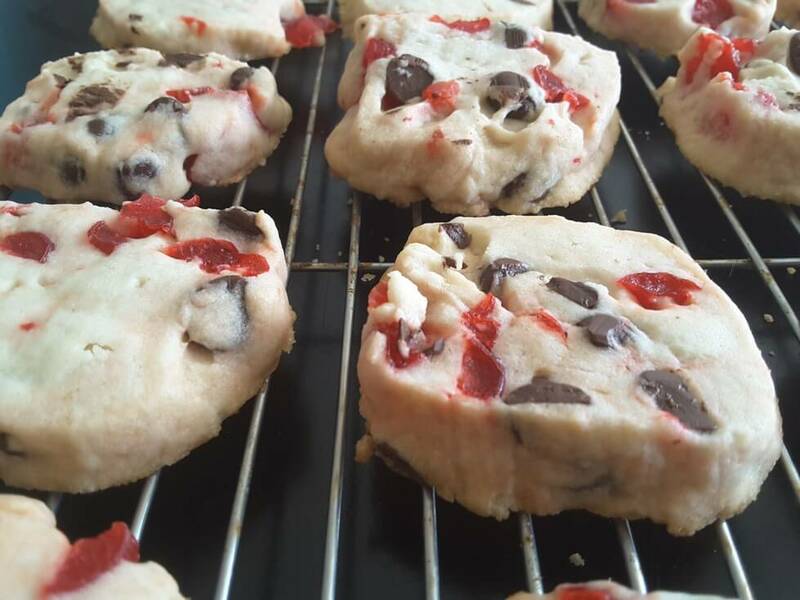 It is a delicious, buttery, flakey cookie base, filled with chunks of cherries and chocolate. Even though baked, the cherries still have a fresh (which is also weird considered how preserved they are 🙂 ) bright taste, and of course, the chocolate pairs great with it. These cookies do need to be put in the fridge for at least one hour between preparing and baking. I’m normally opposed to two part baking, as an hour of down time might kill my baking urge, but this wasn’t bad. 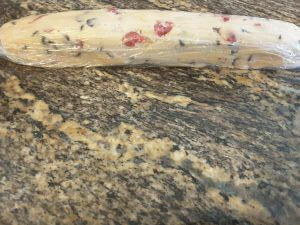 I created a long, thin log in the plastic wrap, and then once it was actually wrapped i patted it into a prettier shape. Mix butter and powdered sugar. Add in flour and salt, mixing till clumps form. 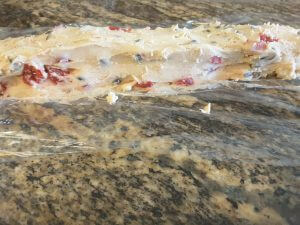 Place batter onto plastic wrap. Use hands to form into long rectangular shape. Completely cover with the plastic wrap, and smooth out shape. 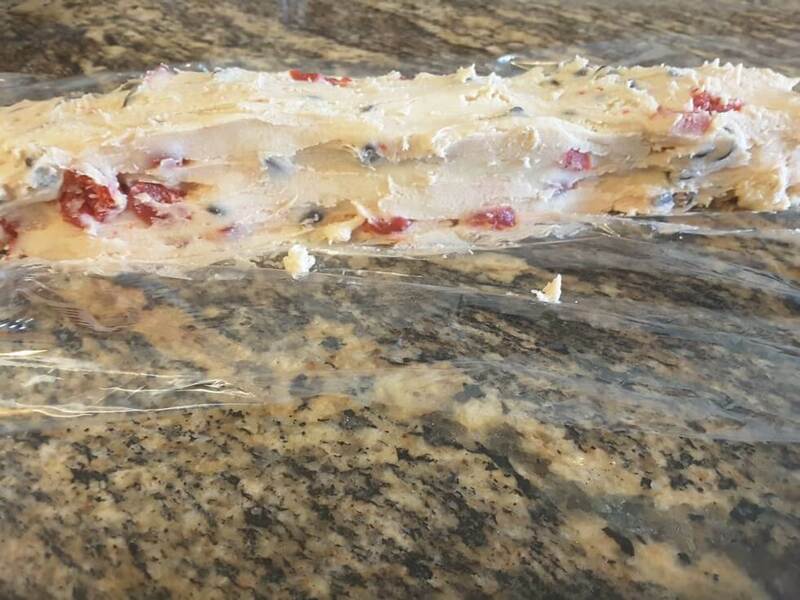 Place in fridge for one hour, minimum. When ready to bake, preheat oven to 325. 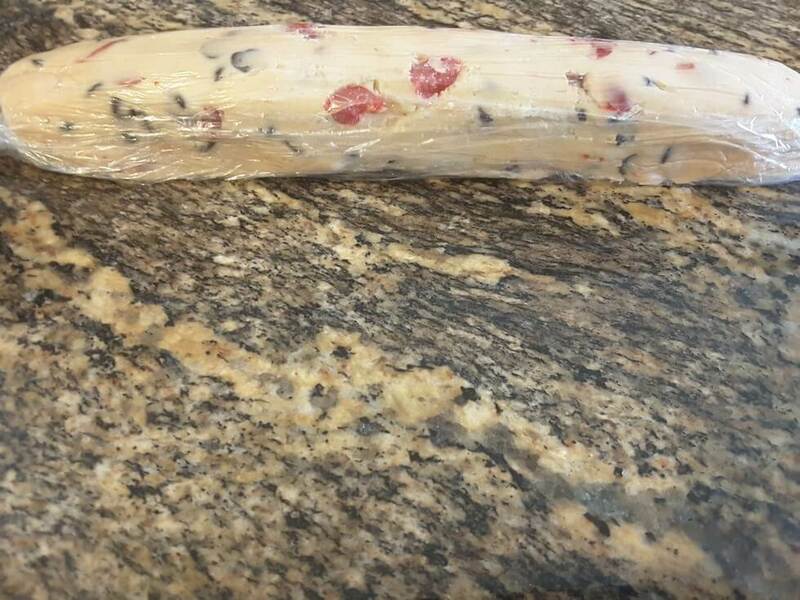 Take cookie dough out of fridge and unwrap. 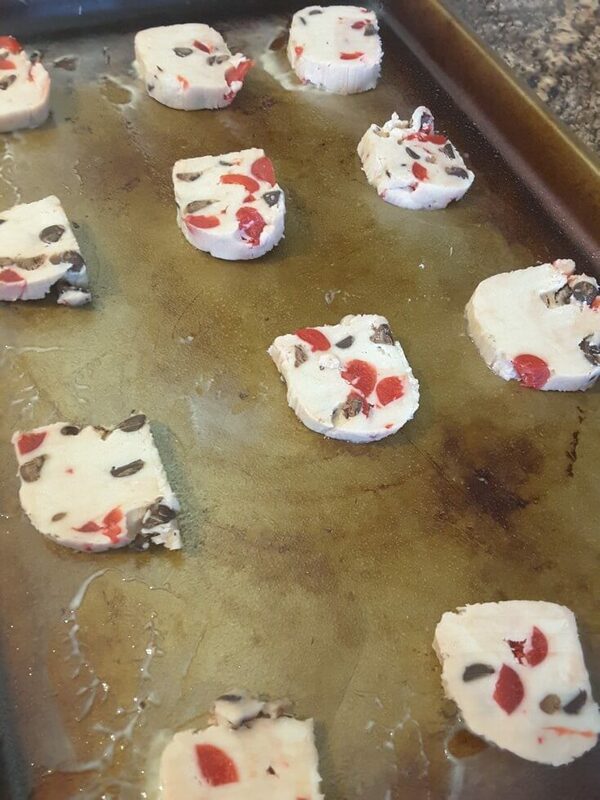 Slice and place on greased baking sheets. Bake for 10-15 until browned.